Buffet style breakfast awaits guests every morning from 8:00 to 10:00 in our dining room. This is a chance to visit with the other guests as well as enjoy a cup of fresh coffee. 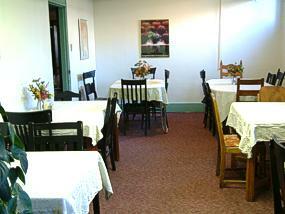 Our breakfast includes an egg dish, pancakes or waffles, potatoes, fresh fruit, toast, and juice.